The Autonomous Video Hut (AVH) is a solar-charging shade area by day, and multi-sided video installation by night. The AVH was onceptualized by video artist, Ethan Turpin, and was supported (in structural fabrication) by artist/engineer, Alan Macy. They provided a structure consisting of 8×14 foot screens for multi-projection pieces and jam sessions between guest video artists. The vision and design of the AVH is to bring elements of architecture, sculpture, cinema, and video-art to audiences in remote places and alternative venues, such as empty urban lots or mountain tops. People seeing projections from outside the ‘Video Hut’, are invited to lounge or interact with the video inside its four walls. For some participatory visuals, the stretch fabric walls provide double-sided, ‘bendy touchscreens’ for visitors. 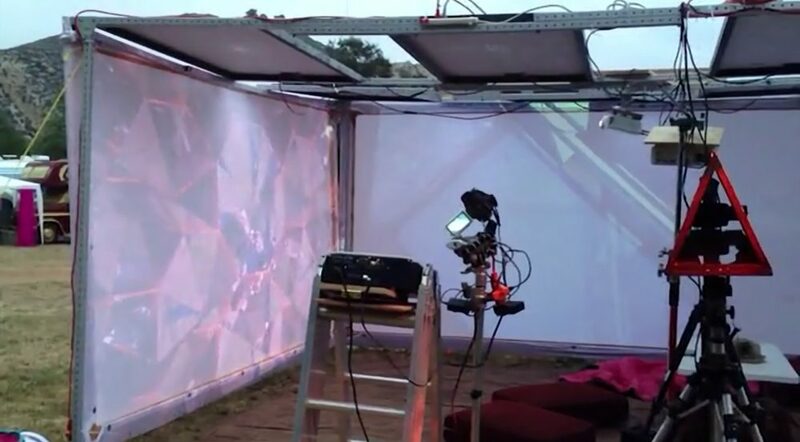 The Autonomous Video Hut, at the 2013 Lucidity Festival in Santa Barbara, was a solar powered structure and series of interactive video art installations. Part of the intent was to create a cycle where the day’s sunlight is collected and the energy is beamed back out at night in the form of video art. Kyle Ruddick and Joseph Minadeo developed a piece for the system using Kinect, Synapse, Quartz Composer and Ableton Live. The hut also featured various combinations of video feedback and primitive objects such as a large triangular kaleidoscope and colored lights which often combined to create stunning results. 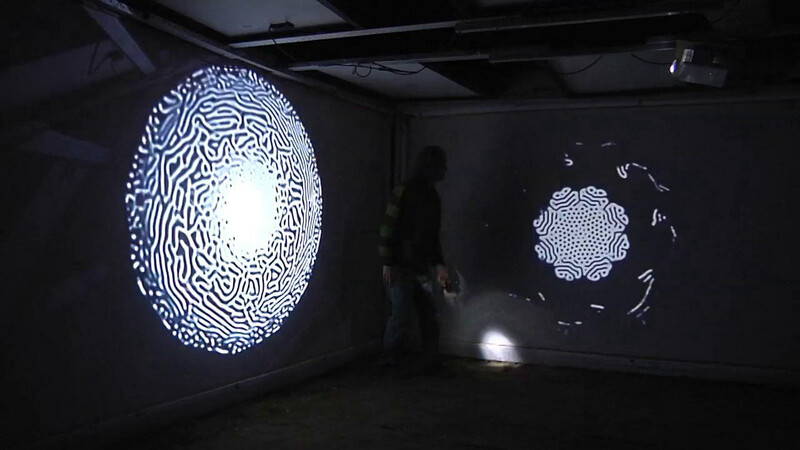 One of the most interesting pieces was Ethan’s Video Feedbackteria, where video feedback combined with a moire pattern from the intersecting planes of the video camera and projector to create a beautiful interactive swirling piece that people could ‘paint’ on with illuminated objects and light sources and erase the image by blocking the projection and selectively stopping the feedback. When left alone, the feedback would resemble cell growth and patterns found in nature. 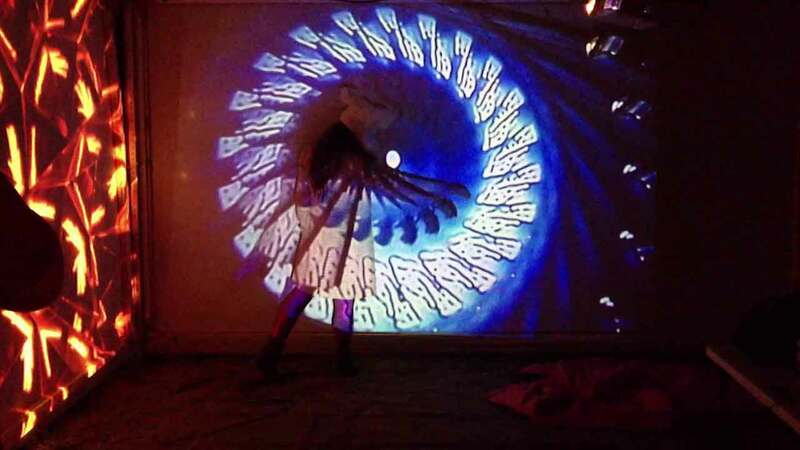 Like so many of the installations, locations and events at Lucidity, people were encouraged to participate in various ways and in the hands of the highly creative people at the festival, emergent, temporal performance pieces were created. Videos courtesy of Ethan Turpin and Joseph Minadeo.